A warm bowl of tomato soup along with a perfectly crisp grilled cheese sandwich is the ultimate childhood comfort food favorite. It is even better when you can dunk the corner of your grilled cheese into the soup! 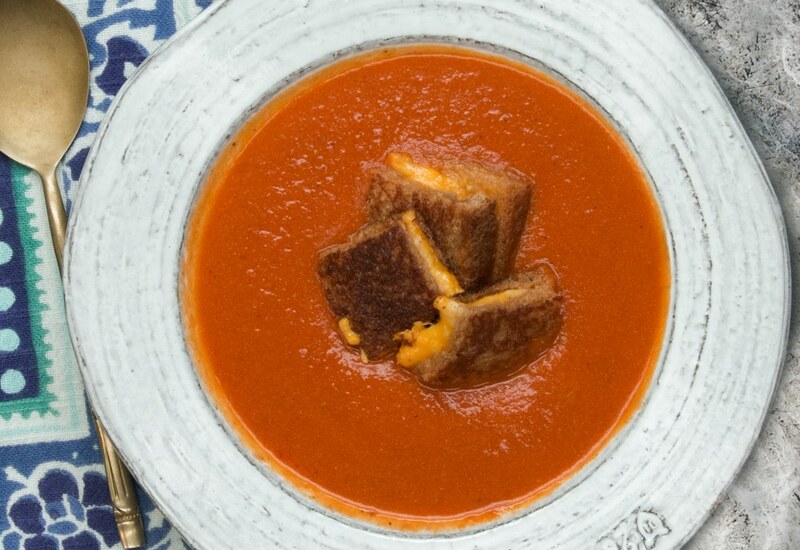 This recipe takes that flavor combination a step further and turns the grilled cheese into "croutons" floating in the tomato soup! Use the MultiPot pressure cooker to turn canned tomatoes and half-and-half into a deliciously creamy soup. It is ready in about an hour using the pressure cooker. In the meantime, you can make the grilled cheese croutons for the perfect topping. Heat oil in pressure cooker set to Sauté on Normal. Sauté carrot, onion, and garlic in hot oil until softened, 8 to 10 minutes; season with salt and pepper. Pour vegetable stock into the pot to deglaze, scraping any browned bits from the pot with a flat-edged utensil. Stir tomatoes with the stock; season with salt and pepper. Select Pressure Cook (Manual) and cook for 30 minutes on High pressure. Blend soup in the pot with an immersion blender fitted with a blade attachment until smooth. Stir half-and-half through the soup; season with salt and pepper. Heat a skillet over medium heat. Lay sandwiches, butter sides down, into the skillet. Spread 1 tablespoon butter onto the top of each sandwich. Cook sandwiches until golden brown and the cheese has melted, 3 to 5 minutes per side. Remove sandwiches to a cutting board and cut into 1-inch squares. Ladle soup into shallow bowls and top with the grilled cheese croutons to serve. Want a lighter option? Use low-fat plain yogurt instead of half-and-half! An immersion blender is the perfect tool for one-pot meals. Instead of transferring the soup in batches to a traditional blender, the small stick blender goes right into the cooking pot to blend the soup ingredients. Per Serving: 394 calories; 28g fat; 23.3g carbohydrates; 13g protein; 66mg cholesterol; 794mg sodium. "croutons"! LOL I've been dipping my grilled cheese in tomato soup for years & never once thought of doing it this way. I'm a bit ashamed. I was afraid they'd get too soggy being left in the soup, but that wasn't remotely an issue. I got a tip from a friend about putting capers in grilled cheese, which I have loved since trying. Works here, too (as long as you like capers, which you should). I used the San Marzano tomatoes because they're great & I love having those cans around the kitchen. I'm a huge fan of this recipe. It's so much easier and quicker than my non pressure cooker tomato soup recipe. Using grilled cheese as croutons is a stroke of genius. Will be making this again. Tomato soup and grilled cheese go together like PBJ, but these grilled cheese croutons are everything! Love this soup, and love making it in my pressure cooker even more. It's so creamy, thanks to the half and half, which I had only ever used in my coffee until now. Love this recipe, it's perfection! I made my grilled cheese croutons while the tomato soup was cooking in the MultiPot. Clever! I'm new to the world of pressure cooking, so the little things make me happy, like how easy it is to deglaze the pot. It works wonders. Instead of using half and half, I did heavy whipping cream, it was yummy.